I’ll say it again and then we’ll get on with celebrating the 4th of July! A Low Sodium diet does not have to bland or boring. It means finding new ways to tantalize your tastebuds using herbs, citrus, no-salt spices, chiles, peppers, onions, garlic, and mushrooms. It means opening up a whole new world of enhancing flavors including liquid exchanges such as coffee, beer, and wine in place of high sodium packaged broths or stock. It means a longer life to many people living with heart disease, hypertension, and kidney disease. That is all. Here’s the Low Sodium menu I have planned for the 4th. Does it look boring to you? First – you must fuel up for the long day ahead, but it’s best to keep it light because there’s a lot of good food ahead. So a parfait like this Tangerine Dream is perfect. 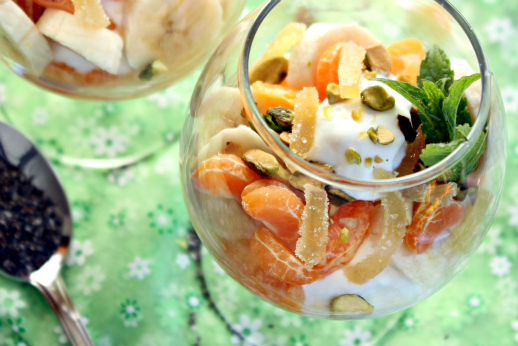 Tangerine Dream Parfait | Greek yogurt, tangerine, banana, pistachios, candied ginger and chia seeds. 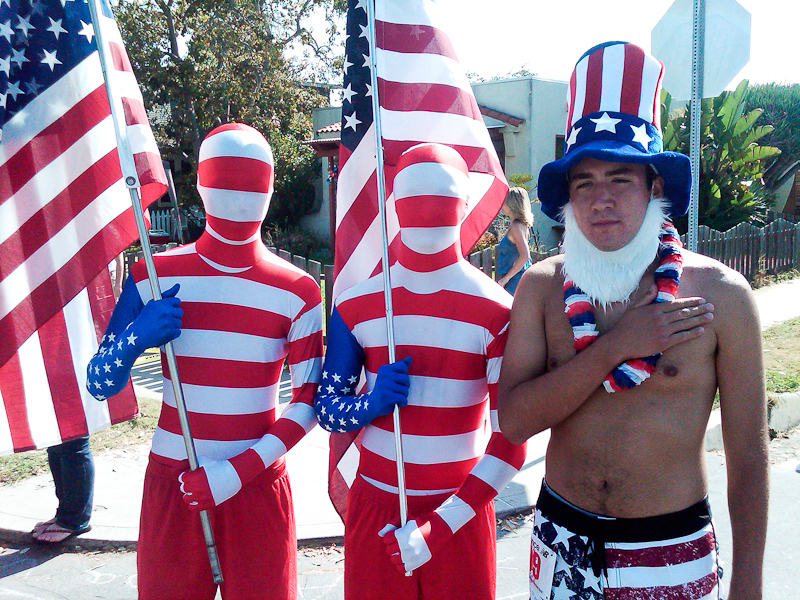 4th of July is the most celebrated holiday in Huntington Beach; filled with patriotism and shenanigans the 4th is all about summer fun and in Surf City USA we are known for our beaches, sun, sand, and surf. 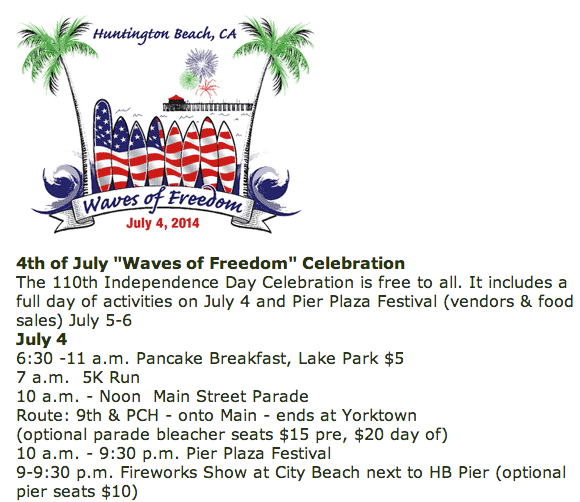 Plus, the Annual 4th of July Parade and celebrations in Huntington Beach begins with the Surf City Run (all levels) and ends with an amazing fireworks display at the beach – and it’s all free! There’s something for everyone and it’s a unique combination of family fun, small town charm, all-American patriotism, beach city vibe, and neighborhood block party. 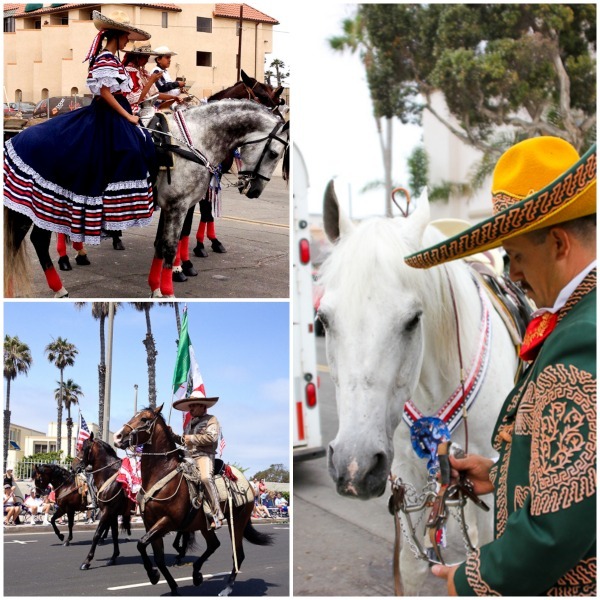 Billed as the largest Independence Day parade west of the Mississippi, with an estimated 100,000 people lining the 3-mile route from Pacific Coast Highway to Main St., this year’s parade is the 110th. We live at the beginning of the parade route and our street and other streets near the start of the parade route are blocked off and used as staging areas. 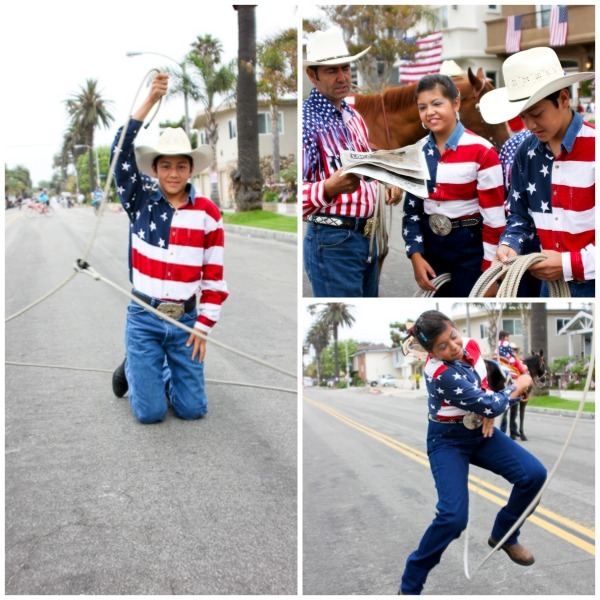 The equine owners congregate on our street, from cute miniature ponies to vaqueros with proud prancing horses and young cowboys and cowgirls practicing their lassoing skills. Excitement is in the air and I love walking up and down the street with my coffee, talking with the riders and snapping photographs. 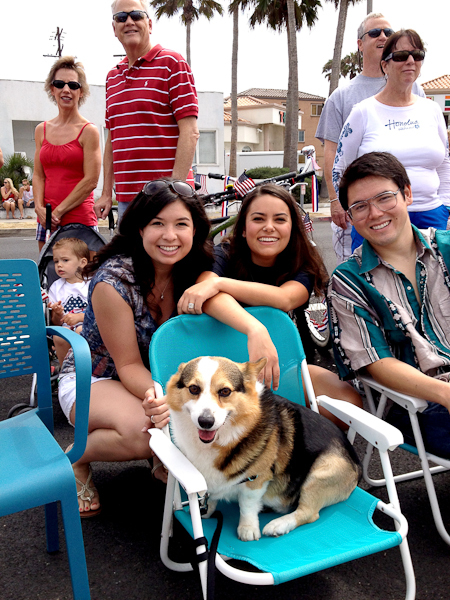 For parade watching, this is the only time of year where we can plop our beach chairs in the middle of Pacific Coast Highway in prime viewing area of the parade against a grand Pacific backdrop. For refreshment, I think Lemongrass, Ginger, Jalapeño Coolers set the mood for a festive 4th. By the time the parade ends, the neighborhood has worked up a collective appetite and celebrations return to friend’s houses along the parade route to nosh and quaff. 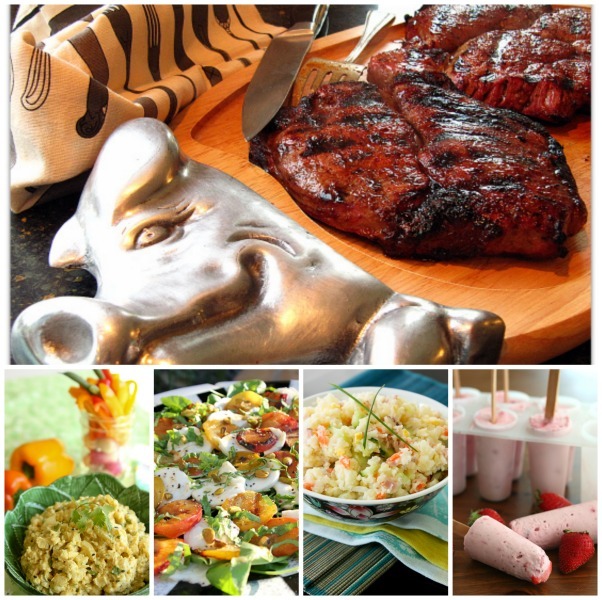 While the 4th is all about America’s favorite summer barbecue foods like burgers, hot dogs, BBQ, corn on the cob, and potato or pasta salads, you can still keep it light and healthier with Japanese Potato Salad instead of heavy-on-the-mayo potato salads and cool fruit salsas and vegetable dips versus high sodium store bought dips. 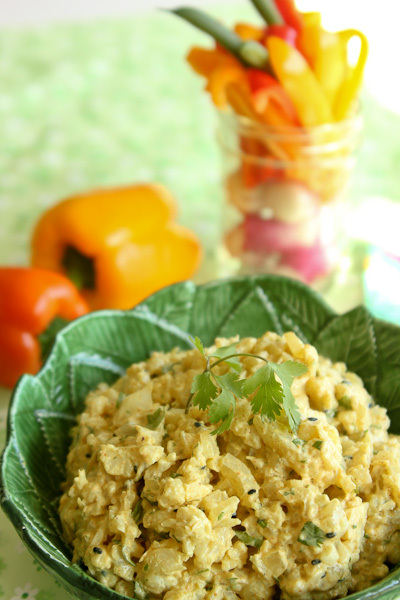 Here’s a Curry Cauliflower Dip that everyone loves – even Huff Post Taste! (included in a football roundup of dips) And, if cauliflower is not your thing, check out 10 Skinny Dips & Salsas for Creamy Zucchini & Goat Cheese Dip or Peach & Nectarine Salsa or 8 other choices! 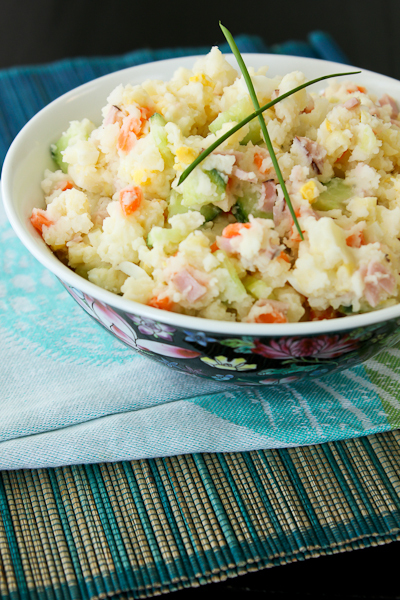 Japanese Potato Salad has very little mayo and bits of crunchy vegetables. And, if you prefer pasta salads, Couscous with Greens, Cranberries and Pine Nuts (an Orange County Fair award winner) with Israeli couscous is a delicious and creative twist on pasta salad. 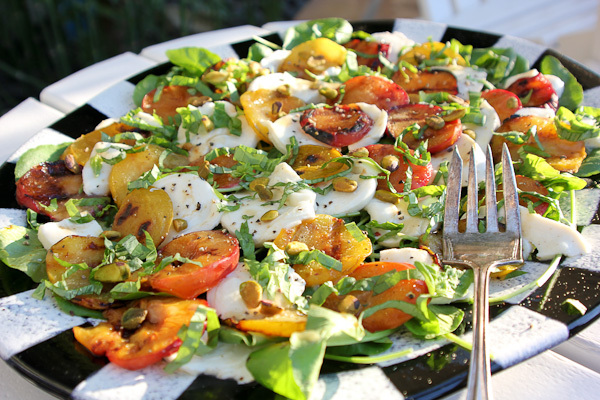 Or, if you would rather steer clear of potato or pasta salads, a grilled seasonal fruit salad like this vibrantly colored, fresh flavored Grilled Pluot and Fresh Mozzarella is what summer’s all about! Super easy to put together and the grill is already going! Unless you’re having a party for 200 like my friend Marina, the main should always be grilled or barbecued somethin’. 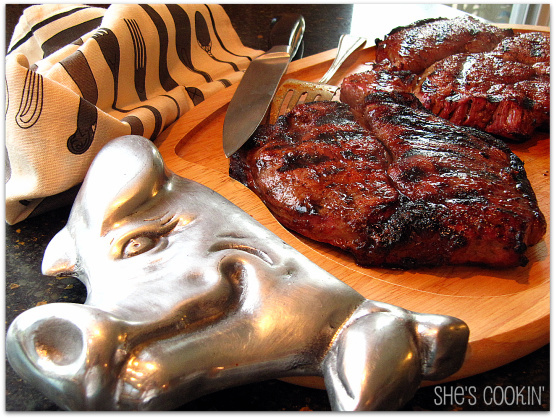 A large cut of choice or prime graded top sirloin with a dry rub, then seared over high heat to a juicy medium rare and thinly sliced on the diagonal makes it easy for the grill master and guests who may want only a slice or two have that option. Going all in with Baby Back Ribs? 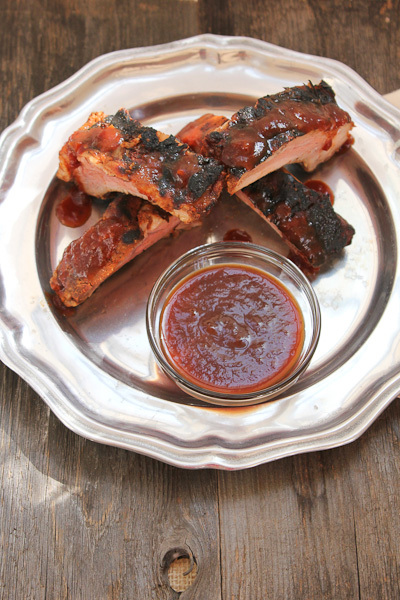 Again, buy quality meat and mix up a batch of Bourbon Barbecue Sauce and friends will want to be on your A-list! Finally, for dessert there’s nothing better to cap off the day and prepare for the evening’s fireworks show than a creamy, dreamy ice cold popsicle. 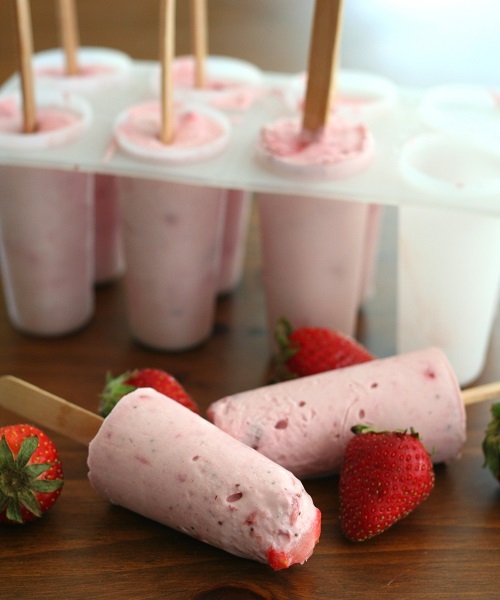 I’m just loving this collection of no-bake berry desserts gathered by Carolyn at All Day I Dream About Food – especially these Strawberry Cheesecake pops that are low carb and gluten free! 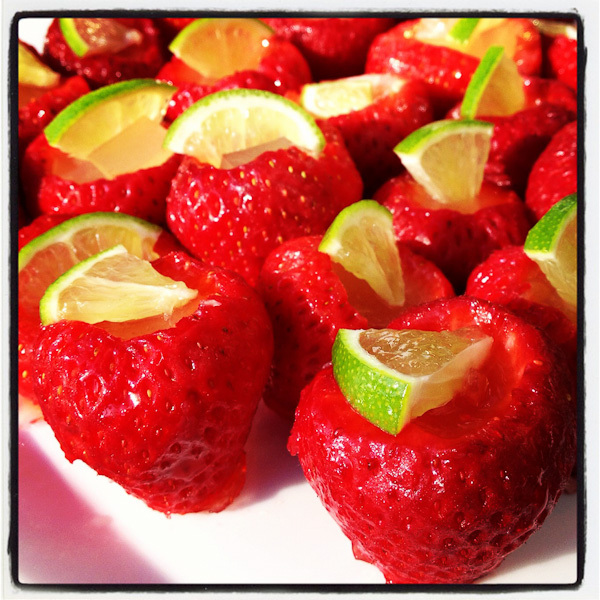 Create your own fireworks with these unforgettable sizzling Strawberry Margarita Jello Shots!